Enjoy a peaceful getaway at the DoubleTree Resort by Hilton Hotel Myrtle Beach Oceanfront, formerly Springmaid Beach Resort. Set across 27 acres on the south end of Ocean Boulevard, this resort has beautiful private beaches, lively entertainment, and plenty of activities, with Myrtle Beach State Park just to the side. Kick off your vacation with a warm DoubleTree chocolate chip cookie at check-in. Know that this welcoming gift is only a taste of the warm, personal service you will experience at this gorgeous hotel. On a side note, DoubleTree by Hilton is a fast-growing, global portfolio of more than 520 upscale hotels with more than 123,000 rooms across six continents. DoubleTree by Hilton prides itself on paying attention to the little details that have a big impact. It offers contemporary accommodations and full-service facilities, including restaurants and lounges, room service, health clubs, business centers, and meeting and banquet space. Hilton Honors members who book directly through preferred Hilton channels have access to instant benefits, such as including an exclusive member rate that cannot be found anywhere else, free standard Wi-Fi, and digital amenities like digital check-in with room selection and Digital Key (selected locations) available exclusively through the industry-leading Hilton HHonors app. To make reservations, travelers may visit doubletree.com. Adjacent to Myrtle Beach State Park, the resort’s beach is one of the areas best for surfing, and is just minutes away from Myrtle Beach’s more than 100 golf courses, Market Common lifestyle center, and other area attractions. It is extremely close to the Myrtle Beach International Airport, which offers non-stop service to nearly 40 destinations, including Atlanta, New York, Chicago, Philadelphia, Boston, Dallas, Washington, D.C., Toronto and more. When traveling with children, I personally believe you need to upgrade to a suite, unless of course you enjoy sharing beds (we Ledesma’s do not). However, the DoubleTree Resort by Hilton Hotel Myrtle Beach Oceanfront offers stylish guest rooms no matter if you are staying in a guest room or a suite. Since there were three of us, we of course, splurged on a suite. The recently renovated guest rooms all have ocean views and private balconies. Guests can enjoy complimentary WiFi, a 40-inch HDTV, mini-refrigerator, microwave, and coffee maker. I love how hotels are beginning to cater to family travel more and more. Refresh in the bathroom with granite vanities, a hairdryer, and indulgent bath products. Since we travel with a toddler, as bathtub is a necessity and the DoubleTree Resort by Hilton Hotel Myrtle Beach Oceanfront certainly came through on that request. It was the perfect way to end each night for our son. The suite we stayed in had two bathrooms. One for the adults and one for Joaquín. You will find beautiful landscapes and a wealth of resort activities at this pet-friendly hotel. Plan outings at our Activity/Recreation Desk, available from Memorial Day to Labor Day. The Palmetto Building has a fitness center with free weights and cardio equipment. They also offer outdoor pools, heated indoor pools, and two lazy rivers. The resort has 35,000 sq. ft. of meeting space, including three ballrooms accommodating 500 guests each. Let their friendly event planners oversee your beachfront party or conference. However, the best part of the hotel are the delicious restaurants. They are so good, you just want to order room service for every meal, which I am ashamed to admit we did minus one local pizza delivery. When you first walk into the resort you are greeted by this chic bar/restaurant. I was so impressed with the decor, that I wanted to skip check-in and order the drink of the day. Unfortunately, those days are over when you have a curious toddler to look after, but I was truly taken aback by the renovations that had been done. It fits my style to a T.
I have traveled to over fifty countries, yet Myrtle Beach will always hold a special place in my heart. I am not sure if I can pinpoint exactly what I love most about it, but I know that the second I step foot on the beach I am at peace and every worry in my life gets washed away with each wave. My advice: give it a try! Just in time for summer 2018, an all-new pool bar and grill will open waterfront at DoubleTree Resort by Hilton, Myrtle Beach Oceanfront. Serving classic summer pool fare, frozen drinks and cocktails, ice cream novelties, and made-to-order snow cones. The bar and grill will be open daily from 11 a.m. to 5 p.m. Also new this summer at the popular 452-room beachfront resort, guests will have the opportunity to cruise the strip on bicycles, which will be available on a first-come, first-served basis. The first two hours of bike usage is complimentary and includes a helmet and lock, with a $9 hourly charge after the initial two hours. 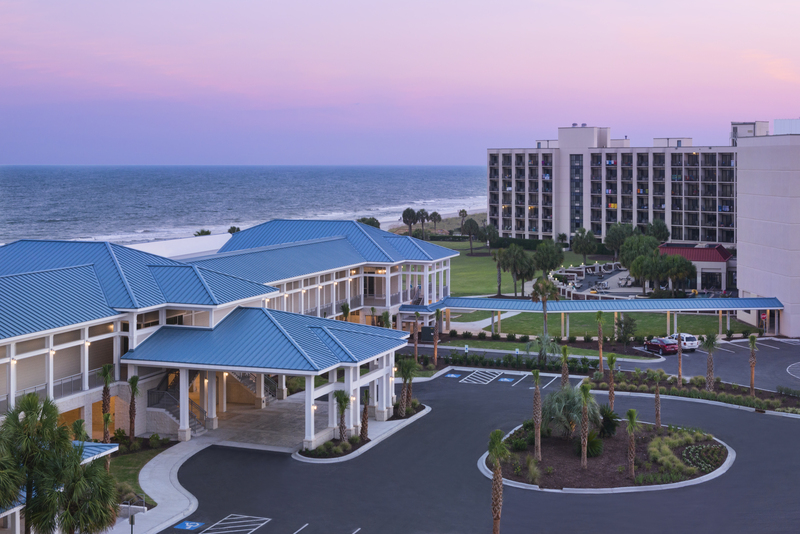 For non-stop family summer fun, DoubleTree Resort by Hilton, Myrtle Beach Oceanfront has got serious game — from unlimited 18-hole mini-golf and oversized yard games such as Connect Four, Jenga and Chess, to oceanfront volleyball, bocce ball and corn hole, there is something for guests of all ages. From June through August, tailor-made activities from the resort’s recreation department also include a range of exciting explorations, including shark tooth hunts, creative crafts, dive-in movie nights, and even beach clean-ups and other activities designed to give back to the community. The DoubleTree Resort by Hilton, Myrtle Beach Oceanfront has partnered with Founders Group International to offer overnight hotel guests golf privileges at an additional 22 courses, bringing the total number of concierge courses of play available to 27. Considered by many as the golf capital of the world, Myrtle Beach offers exceptional play at a multitude of championship courses for players of varying skill levels. With this new partnership, the DoubleTree Resort by Hilton, Myrtle Beach Oceanfront can now schedule tee times for guests at some of the most desirable, difficult and scenic courses in the area.